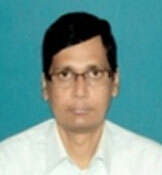 Dr. Srimanta Patra, Associate Professor, had his B.Sc. (H) from Belur Vidyamandir & B.Tech, M.Tech & PhD from Calcutta University. He has been teaching cement Tech & Non Oxide Ceramics. His current research interest is on synthesis & characterization of High Temp. Ceramic Semiconductors. He is also in charge of Nano Technology lab.